Subtitle: To comprehend how our leaders could hate this Industrial Civilization so much they would take gradual action to destroy it, we have to begin at the religious level - the religion of the occult. Remember, our current and past national leaders not only control armies, navies and aircraft of the word, they control our national environmental policies as well. The average American citizen is just trying to make a living, build and raise a family, and secure a future in which he can pursue his Constitutional guarantees of "Life, Liberty, and the Pursuit of Happiness". Very few citizens of any industrialized country have any idea that their own leaders are secretly following a radical plan to destroy our Industrial Civilization, replacing it with a "balanced" farming economy like that which existed 300 years ago! Impossible, you say? We encourage you to read this article with an open mind, for we are under a sophisticated attack in a war that very few people even realize is occurring, with even fewer realizing that a deadly "silent warfare" is directly aimed at two-thirds of all mankind! Let us begin our discussion by laying a philosophical groundwork for the maps and statistics we are about to examine in Part 2. We will be quoting from New Age, and New World Order authors. As you read their terrible hatred of our civilization, remember that President Bill Clinton staffed his Administration with Environmentalist Radicals who share this hatred; further, understand that President Bush has silently continued these radical environmental policies, in many cases retaining the very people who were carrying them out under Clinton! Remember, Bush refused to cancel any of the Clinton Executive Orders, even though many of them are so environmentally radical, they would dismantle our way of life according to the most radical of plans we are sharing with you today, were they ever enacted. To make matters worse, President Bush allowed a very radical Sustainable Development Report to be sent to the United Nations, agreeing that "human activity" is responsible for the so-called "Global Warming". You can read full details in NEWS1663. Even though Bush tried to publicly distance himself from the issuing of this report, he never rescinded it. Thus, President Bush indirectly placed himself as a soul-brother on this issue with President Clinton. Whenever you hear of Bush taking a Conservative stance on an issue, remember he is only following the Dialectic Plan to disguise his true efforts: Two Steps Forward, One Step Backward, but Always Ahead Toward the Goal. A corollary to this Dialectic is that zig-zag steps are necessary for a leader to disguise his true intentions, his true goal; thus, a politician will often take seemingly contradictory positions designed for this very purpose. President Bush showed his true colors by retaining Clinton's Executive Orders on environmental issues and by retaining key Clinton administration figures in sensitive positions from which they could continue Clinton's march toward dismantle this civilization. We contend that this "Third World War" has been waged by many "Silent Weapons", among them deliberately created weather that devastates the land and its inhabitants, so that, one day, the pressure will become "too great and they crack up". * "Recognize that now is the time to stop thinking it is not necessary to do something proactive for yourself and this Earth ... We need to hear this call now and begin reversing the damage and neglect done, believe it or not, practically all in the last 100 years on this Earth, which has survived for billions and billions of years just fine, until man came along. At this rate of damage how much longer do you really think it's going to take before we are all living in a plastic dome, breathing man-made air, drinking man-made water, and eating man-made food? Not too much longer." "Already natural wonders and parks are being ruined by overcrowding tourists. Because preserved Nature is becoming rarer and rarer, there are less places to go, so more and more people are overcrowding the ones we have left, and there is overload occurring from the poisonous carbon dioxide we exhale, the pollution we bring, and the trampling of too many people in too little space. Pretty soon, these natural wonders will be kept behind ropes in a museum of sorts. Doesn't that disgust you?" ["The Diary of a Walk-In: Your Personal Wake-up Call", by Susan Elaine, Starlight Communications, Vero Beach, Florida, 1996, page 37]. This phrase sums up the prevalent attitude amongst most New Agers, as they have bought the lie hook, line, and sinker that "Mother Earth" is so fragile that man can destroy her, and that man truly is systematically destroying her. Occultists of almost every stripe believe Mother Earth -- this planet -- as a living, breathing, thinking goddess. They call her Mother Gaia. And, they believe Mother Earth is overloaded by 4 billion people and is about to die unless they successfully conclude their "Silent Weapons" war. Every time the light of honest investigation has been turned on a claim of environmental destruction, that claim has been shown to be flat-out wrong. In fact, the Environmentalist movement has lost so much ground over the issue of "destroying" forests, for example, that they have switched tactics. Instead of trying to convince Americans that the forests are being destroyed, they have switched to claiming that human activities within forests are "endangering" certain species. Thus, they have cooperated with their New Age brethren within Presidential Administrations to get huge tracts of land declared off limits to certain human activity, like timber harvesting, because they endanger the Spotted Owl, or some other species. This tactic has proven to be far more effective in accomplishing their goal of getting huge tracts of land declared off limits to human activity and commerce. The ultimate objective is to set aside over 50% of America, and the world, to human activity. We find it very interesting that Susan Elaine's Guiding Spirits single out our National Forest Park system, complaining that tourists are ruining it!! Have you noticed the news, recently, that many Parks have had to be closed because of "Budget Cuts"? How convenient. Many Parks lie within the United Nations Bio-Diversity areas that are planned to be set aside. * Now, let us examine some of the New Age hatred to our current Industrial Civilization from a completely different source, New Age scientists. Since man has made so many "messes" while we were industrializing our planet, from the turn of the 20th Century, it just makes sense for these occultists who believe this, to want our civilization destroyed. Since man is the most barbaric animal on the face of the planet, it also makes sense for "enlightened" men to control the other men who are not enlightened. This brings us squarely back to our New Age/New World Order Plan to set aside huge areas of America, and the rest of the world, that will be off limits to human living and commerce. This is the Plan, as we will demonstrate through the various parts of this series. "Enlightened" men in both the Congress and the White House are hard at work to implement this program, under innocuous names and guises, of course. And, when the timing is right, massive "crises" will explode all over the world to panic everyone, including Americans, to allow their governments to "temporarily" take away our rights so that we can be protected. This is probably when an "Environmentally Friendly" President will publicly declare his "wise" and "benevolent" plan to restrict all humans to certain areas of the country, placing the rest of this great land completely off limits. And, he will be applauded for these efforts, by the media firstly, by other public officials, secondly, and by the average American on the street, finally. * Alice Bailey, writing in her book, "The Externalisation of the Hierarchy", in November, 1939 -- Bailey's Guiding Spirit began to address the 'Economic Problem'. "There are adequate resources for the sustenance of human life, and these science can increase and develop... Man is the controller of it all, and they belong to everyone and are the property of no one group, nation, or race. It is solely due to man's selfishness that ... thousands are starving whilst food is rotting or destroyed; it is solely due to the grasping schemes and the financial injustices of man's making that the resources of the planet are not universally available under some wise system of distribution." 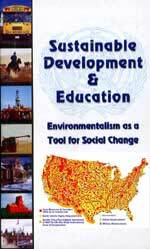 Thus, you need to watch the U.N. World Forum On Sustainable Development being held August 26 - September 4, 2002, in Johannesburg, South Africa. You will hear two major themes: 1) The overriding need for rich countries to put poor countries on a global welfare system euphemistically called a "Redistribution of Assets"; 2) Our current way of life -- Industrial Civilization -- is not "sustainable" and must be dramatically changed. You cannot discount this conference because over 100 presidents, prime ministers, and other high-ranking officials will be attending this meeting, and they will overwhelmingly vote to make our civilization "more sustainable". Their very presence at this conference strongly imprints a sense of validity to the concept of "sustainability", so a great many people worldwide will come to believe it. And, despite Bush's public stance against the goals of this conference, time and events will demonstrate his private support. transformed from one state to another...the energy they embody doesn't disappear. It is merely transferred back somewhere else into the environment." However, this transferred energy is weakened, Rifkin says, so that it is "no longer capable of conversion into work ... Energy can only be transferred to a dissipated state." Therefore, Rifkin believes the world is currently producing too many material things that originally use too many resources. If the world is not to soon find itself in a position of running out of usable energy, Rifkin proposes that we must change our lifestyle dramatically. We must move into a State run economy that would regulate the production of all material things so the world will not run out of usable energy. This lifestyle is called "Low Entropy". This change, says Rifkin, will require a radical "new world view", and he urges draconian measures to achieve this new thinking. He says, "The radical change in world view required to make this transition will have to be accomplished overnight. There will be no time for polite debate, subtle compromise, or monetary equivocation. To succeed will require a zealous determination, a militancy, if you will, of Herculean proportions." (Ibid, p.186, Emphasis added). Did you catch the key words here? No polite debate, subtle compromise, or monetary equivocation. We know now that Rifkin does not plan for Congress to be involved in this change. Indeed, many New Age leaders have repeatedly written that our Constitutional System of Government must be abolished and replaced by the "enlightened" dictatorship of the United Nations. Only then, they argue, can the draconian steps necessary to "restore Nature to balance" be taken. Remember these words as you read the rest of this article. Key scientists have done their job, working globally with a "militancy" of "Herculean proportions"! Soon, the time is coming when a President will announce the absolute necessity of achieving an "Overnight change". Or, perhaps, a new, powerful storm is planned that will change minds overnight, suddenly making possible what was heretofore politically impossible. We shall address that issue In Part 4 of this series. * Clinton - Gore - Bush all support this radical plan and are working through regulatory efforts to achieve it. Prior to Clinton winning the presidency, I had taken solace in the thought that no politician who wielded real political power shared this satanic view of our "unsustainable" civilization. However, the past 10 years of Clinton -Bush have demonstrated how far regulatory power has gone in forging this view of our "unsustainable" Industrial Civilization. Just before Clinton named Al Gore as Vice President, Gore published a book entitled, "Earth In The Balance". Toward the end of the book, Gore makes an extremely strong statement that reveals his hatred toward our Industrial Civilization. We encourage you to read the radio transcript, CE1055, for a full treatment of Gore's radical book; for now, we will focus on one key part of his argument. On page 325, Gore proposes something which seems not reasonable. He states that the internal combustion engine (your car) poses a greater threat than nuclear weapons to the future of mankind. The nations of the world have gone to great lengths to eliminate nuclear weapons, so it is not too much of a stretch to believe a similar effort will be made to eliminate this "threat" as well. But, the point is, that Gore proved through this book that he supported the most radical view of the "threat" posed to this planet by industrial human activity. We surmised that Clinton must support Gore's radical views or he would not have chosen him to be Vice President. In the next 8 years, Clinton proved just how radical his views were as he issued Executive Orders by the bushel basket that regulates our country toward the most shocking environmental plans possible [We shall show this radical plan in Part 3]. President Bush has continued these radical environmental policies of Clinton - Gore in his practice, even though his public rhetoric is taking a more Conservative tone. "Our Present Civilization Has To Die"! The powerful Club of Rome lists one of its four plans for the future world in these words: "A new ethic in the use of material resources must be developed which will result in a style of life compatible with the coming age of scarcity." ("Mankind At The Turning Point", Mesarovic and Pestal, 1974, page 147). The demon Master D.K., writing through Bailey in "The Externalisation of the Hierarchy", states, "Today we are watching the death of civilisation... "Such a change is rapidly coming and is regarded by some as death -- terrible and to be avoided if possible. It is indeed death, but it is benevolent and needed...For the progress of the soul of the individual and the soul of humanity, death is inevitable, good, and necessary." (Pages 114-115; Emphasis added). When our current political leaders preside over the death of our civilization, they will view it as a "benevolent death". For a good idea as to what this "massive global catastrophe" is planned to be, read Part 4, "The Coming Superstorm". Just remember that Bell/Strieber's book originated with the "Guiding Spirits" of Ruth Montgomery many years before the book was written. This coming superstorm originated in the demonic realm, and it may fulfill many Bible prophecies about the End of the Age. The incessant propaganda trumpeting that mankind's current Industrial development is "unsustainable" is leading directly to this very point, that Mother Nature [Gaia] will have to take action through extremely powerful storms, in order to return the forces of the earth to "balance". ["Herald of A New Age", Ruth Montgomery] Remember this fact as you read Parts 3 and 4. Did you catch that key statement? They "frequently create crises in order to bring an end to the old and the undesirable". This is the ultimate goal of the Illuminati as they attempt to use "silent weapons" of which we have no idea even exist in order to gradually destroy our entire way of life, paving the way for an agricultural society like that which existed 300 years ago. From now on, when you hear PETA, Sierra Club, Greenpeace, or some other radical environmentalist group proposing safeguards for fish or wildlife that sounds perfectly ludicrous, you know their ultimate goal: the destruction of our Industrial Civilization! Whenever you see a government document using the words "sustainability", "unsustainable", or "sustainable", you can rest assured this government is fully in sync with Rifkins Low Entropy vision. 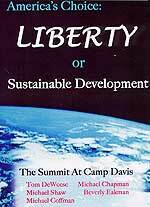 This coming World Conference On Sustainable Development being held in Johannesburg, South Africa, is being held precisely to develop tactics to first raid the coffers of Industrialized nations, and then to destroy them. Our current government led by President Bush also supports this radical view, even though political pressures right now are forcing him to adopt the zig-zag Dialectic approach with his public rhetoric. When Bush refused to cancel Clinton's numerous Executive Orders advancing the radical environmental cause, he showed his true colors; likewise, when Bush allowed his administration to issue that radical Sustainable Development report to the U.N. that tied "human activity" to the supposed list of environmental crises facing the world, he showed his true character. Now that we have established the occult religious foundation of destroying our Industrial Civilization, we can appreciate the depth of hatred our occult leaders and their followers have toward our way of life. The key is for political leaders who are secretly occult to gradually wield "silent weapons" that will force people to finally crack under the deliberate pressure so they will allow themselves to be subjugated just as the Illuminati wants them to be. However, the Illuminati needs for us to be kept ignorant of what is happening to us gradually, year after year, decade after decade. What did New Age author, Bill Cooper, say? When such a ill-educated public faces "silent weapons" designed to move and mold them into the draconian policy of the Illuminati, they will not be able to understand that some of the most important silent weapons employed against them are Forces of Nature, i.e., Weather Control. Such a public will totally be unprepared to accept a new reality: our scientists can and do control the weather so efficiently that storms and droughts can be used devastatingly as a weapon against an enemy. The largest enemy the Illuminati believes they are facing is our Industrial Civilization. Let us now move to Part 2, "Weather Control and Weather Warfare".